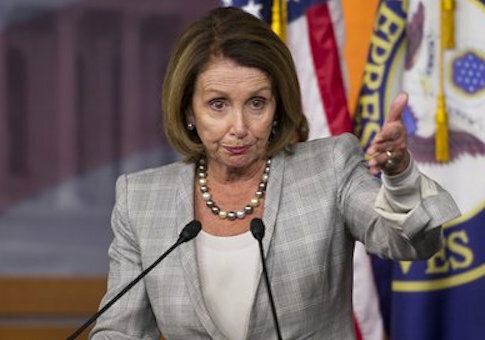 House Minority Leader Nancy Pelosi (D., Calif.) called on the Department of Justice Thursday to investigate the non-profit Center for Medical Progress, which filmed the videos of Planned Parenthood officials discussing the sale of aborted baby body parts. In her first public statements about the videos, Pelosi accused the California-based anti-abortion group of creating a "controversy that doesn’t exist" regarding Planned Parenthood’s abortion practices. "Let’s have an investigation of those people who were trying to ensnare Planned Parenthood in a controversy that doesn’t exist," Pelosi said. The Democratic lawmaker, who joins a slew of her colleagues urging the Justice Department to probe the Center for Medical Progress, said Americans should believe the taxpayer-funded Planned Parenthood when the organization insists it has "done nothing illegal." "Planned Parenthood has said that they have done nothing illegal," Pelosi explained. "They do not ever charge, which would be illegal, for fetal tissue. They have only defrayed the cost of mailing that to someone, which is not breaking the law." Rep. Jan Schakowsky (D., Ill.) and three other House Democrats this week wrote a letter to Attorney General Loretta Lynch, warning that the Center for Medical Progress may have violated state and federal law when secretly recording the videos of Planned Parenthood officials. On Wednesday, Lynch said the Justice Department would "review all the information and determine what steps, if any, to take at the appropriate time" in regard to the controversy. Following the release of the first Planned Parenthood video, in which a top doctor at the organization touts the sale of heart, liver, and other parts of aborted fetuses, House Speaker John Boehner (R., Ohio) condemned the "gruesome" abortion practices and demanded hearings be held on the issue. However, Pelosi insisted that the federal government should focus on the Center for Medical Progress in its probe, dismissing Republican pushback against Planned Parenthood as something that "has been going on for a long time." Hours after the second video surfaced Tuesday, Rep. Diane Black (R., Tenn.) introduced the Defund Planned Parenthood Act, which would strip the organization of taxpayer dollars. Several Republican lawmakers and presidential candidates have called on the federal government to defund Planned Parenthood, which has received $27.8 million in taxpayer dollars this year alone. Hillary Clinton leads the 2016 Democratic field in donations from Planned Parenthood employees and has remained silent on the issue. This entry was posted in Politics and tagged Abortion, Jan Schakowsky, John Boehner, Nancy Pelosi, Planned Parenthood. Bookmark the permalink.